A dense, pyramidal tree with stiff, dark green needles. It is fast growing and tolerant of heat, drought, and urban environment. 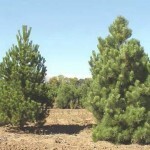 Use as windbreaks, screens, and mass plantings. It needs full sun, thrives in many soils as long as they are well-drained.